Fiberglass Lighting and Utility Poles | Wood Preservers Inc.
We are a manufacturer of 100% filament wound fiberglass composite utility / lighting poles that are used both in the residential and commercial lighting markets. 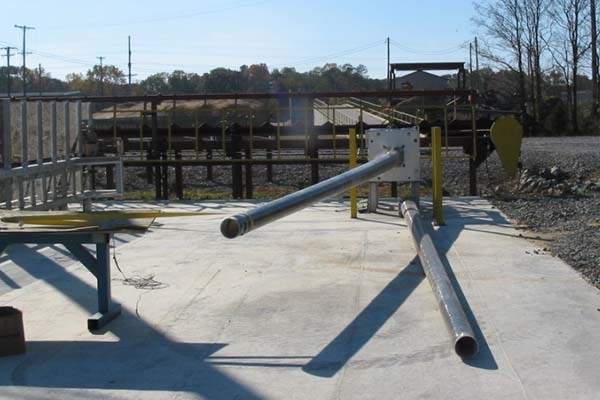 To meet your specific needs, we manufacture fiberglass poles to be used in either a direct bury or an anchor based application up to 60' in length. Direct bury fiberglass poles are placed directly in a hole dug into the soil with no foundation requirements. Anchor base fiberglass poles have a metal base that bolts onto anchor bolts that are pre-existing in a concrete foundation. The interior of our fiberglass poles are hollow to allow the electrical wires to be hidden inside of the fiberglass pole. Our fiberglass poles also have electrical access hand-holes, with pre-made covers, to allow for easy electrical connections. Our composite utility poles come in either a natural or a smooth finish, and can be made in either a standard color of black or bronze, or a custom color made to suit your specific project. Our color is applied to the fiberglass pole in an Ultraviolet (UV) stabilized, pigmented resin that will give you years and years of maintenance free use. You can choose either a top cap or tenon depending on your specific light fixture mounting requirements. Other benefits of our fiberglass poles are that they are corrosion resistant, they will not dent or crumple and they have non-conductive shafts. For more information, or a quotation on your specific project please do not hesitate to contact Brenda or Morgan with any questions that you may have. Also see our wood utility poles.